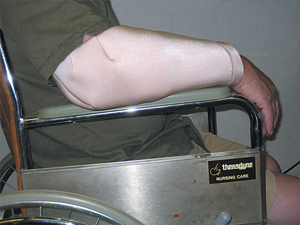 Two layers of soft, lightweight MicroSpring Textile™ form a loose-fitting tube that stays in place to protect the forearm while protecting the elbow with 5 layers of MicroSpring Textile™. Will not roll around the elbow. Unlike traditional fabric sleeves that are tight and binding, the layers of microfilaments allow air-flow and moisture transfer.